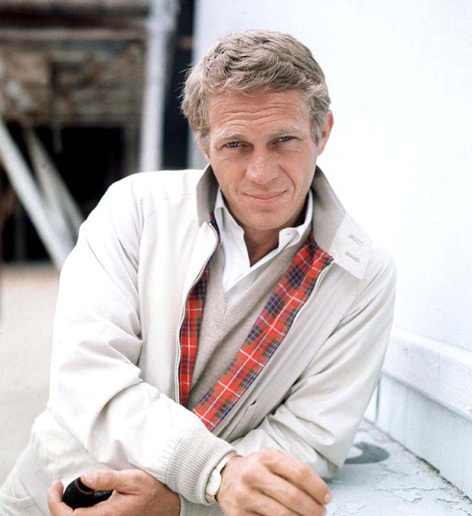 Elvis Presley, Steve McQueen, Frank Sinatra, Daniel Craig, Jason Statham, they all have worn the same jacket: the Baracuta G9 Harrington jacket. In Guy Ritchie’s latest action film The Man From U.N.C.L.E. 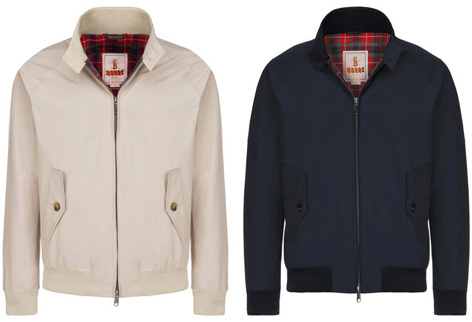 the Baracuta is once again prominently featured as the ultimately cool jacket. Let’s take a closer look at the jacket that you might not have noticed but has been around for almost 80 years. 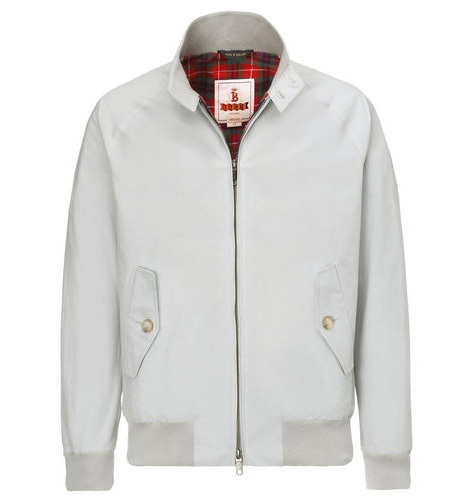 The Baracuta G9 Harrington jacket was designed in 1937 in Manchester, UK and at first popular with golfers. 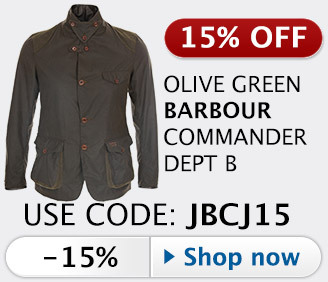 The G9 is a lightweight, waist length jacket with an elasticated hem and sleeves. It can be recognised by its red striped Fraser Tartan cotton lining, large side pockets with flaps, and a double-button collar. Owners of the jacket often leave the jacket half open or roll up the sleeves a bit to reveal the signature red lining, and flip up the collar for the ultimate cool look. The most popular colours are the McQueen Stone (white, see image above) or Sand or Navy, but the jacket is currently available in many other colors as well. 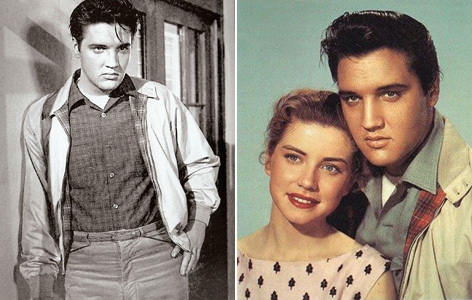 The Baracuta became known to a wider audience when superstar Elvis Presley wore the Baracuta G9 jacket in the movie King Creole in 1954. The name, ‘Harrington’ which is now synonymous for Baracuta G9 style jackets, is said to have originated from a character in 1960s American soap tv series Peyton Place. In the series, character Rodney Harrington, played by Ryan O’Neal, was wearing the G9 jacket, supposedly leading to the G9 being dubbed the ‘Harrington’. 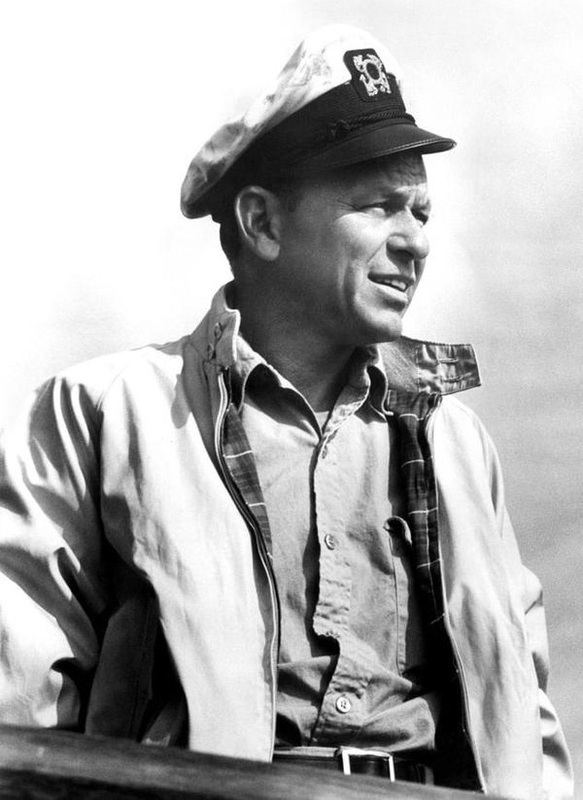 One of the most popular and influential musical artists of the 20th century, Frank Sinatra also brought the Baracuta to the big screen in Assault on a Queen (1966). The jacket really became immortal thanks to ‘mr. 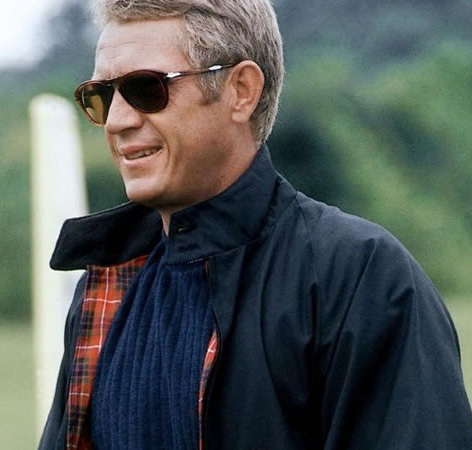 Cool’ himself: Steve McQueen wore the Baracuta G9 in both his personal life and several movies. A navy G9 jacket can be spotted in The Thomas Crown Affair (1968) during the scene in which McQueen flies a yellow glider. In the scene he also wears his favorite Persol 714 folding sunglasses, cream colored trousers and chukka boots, a classic look often seen on Steve. Steve was often photographed wearing a light colored Baracuta G9 (a colour now dubbed ‘McQueen Stone’) by his friend and photographer William Claxton. Sharing a passion for fast cars, McQueen and Claxton became friends early in McQueen’s career and remained close until his premature death. Check out Claxton’s book (Amazon.com, Amazon.co.uk) for a great photo-series of Steve McQueen at his most cool. In 2007, Baracuta released three special jackets of the G9 with special packaging, quotes by Elvis Presley, Steve McQueen and Frank Sinatra printed on the lining as well as a serial number. Only 70 pieces of each were made. 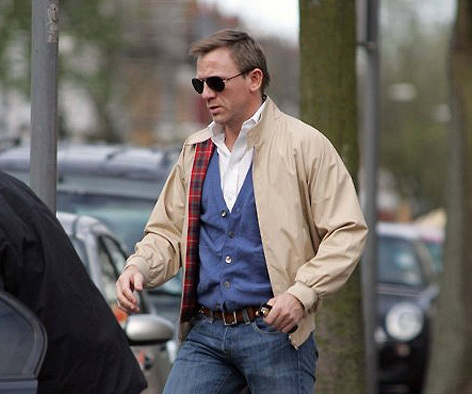 James Bond actor Daniel Craig, often inspired by McQueen’s sartorial style, has been spotted with both the Sand Baracuta G9 in his private life. 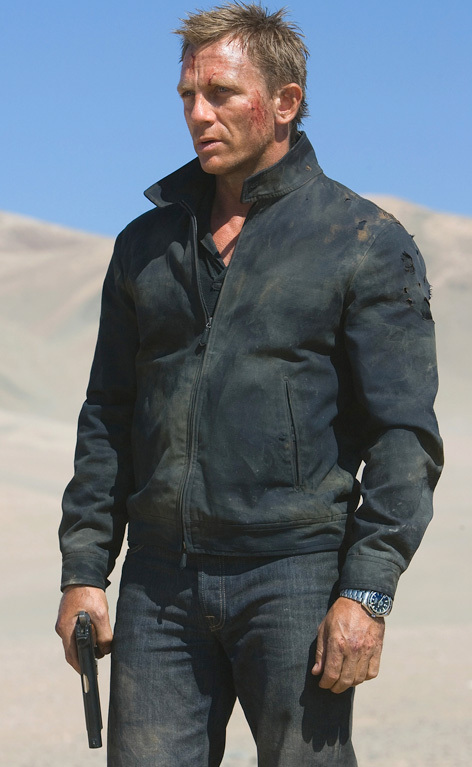 The Baracuta jacket hasn’t featured in a James Bond film (yet), but Craig’s Tom Ford Harrington jacket from Quantum of Solace is certainly inspired by it. (Note that some photos online of Craig in the desert with the jacket have the red lining Photoshopped on the image, but this is fake, the jacket is not a Baracuta and does not have the tartan lining). 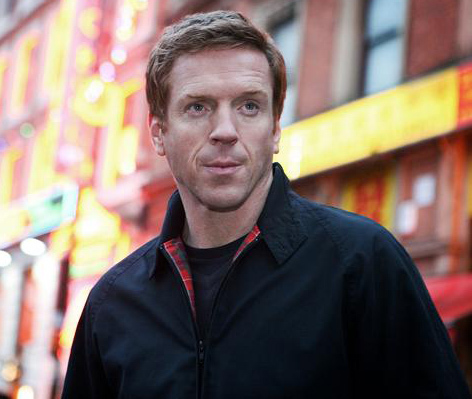 Actor Damian Lewis is trying really hard (and succeeding!) 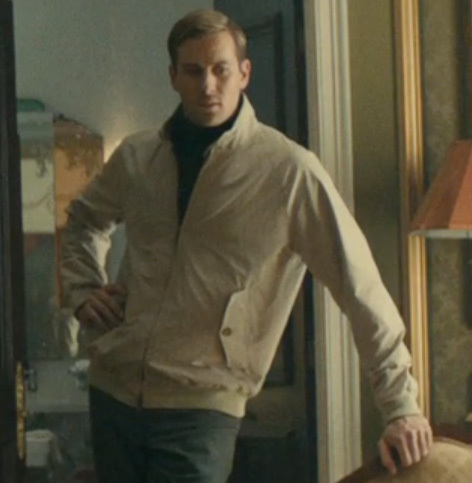 to look like Steve McQueen in the 2010 tv film Stolen, wearing a Baracuta jacket. Actor Bradley Cooper wears a blue Baracuta G9 in comedy film The Hangover - Part 2. 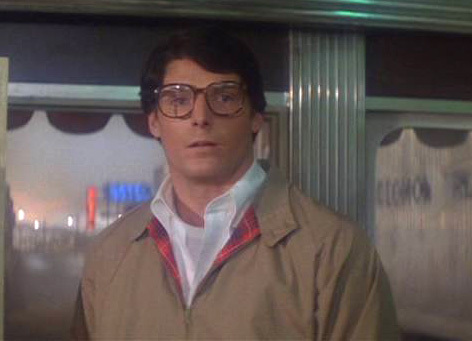 Even Superman wears a Baracuta G9 when he's off duty. 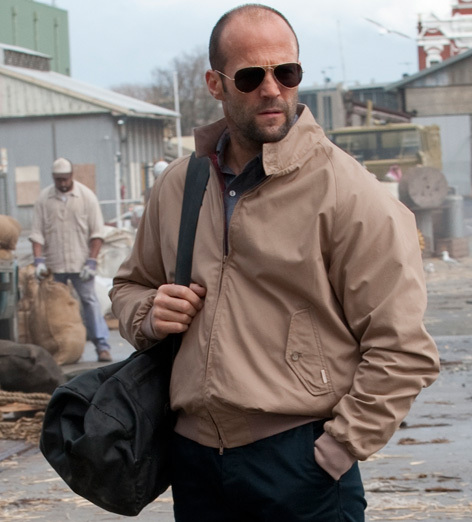 Another movie star that pulls of the McQueen coolness, Jason Statham, wears a sand coloured Baracuta G9 in the movie Killer Elite (2011) and has been spotted wearing a black G9 jacket in his private life. 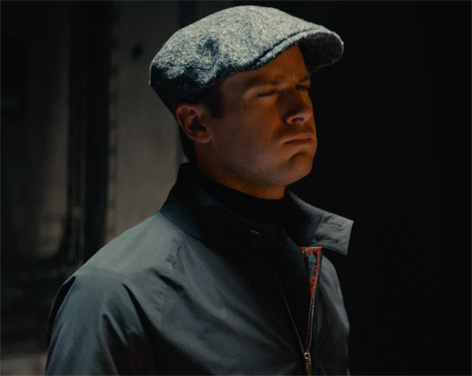 Armie Hammer - The Man From U.N.C.L.E. In 2015, the Baracuta star continues to rise in the movie The Man From U.N.C.L.E., an (audio)visual treat directed by Guy Ritchie. 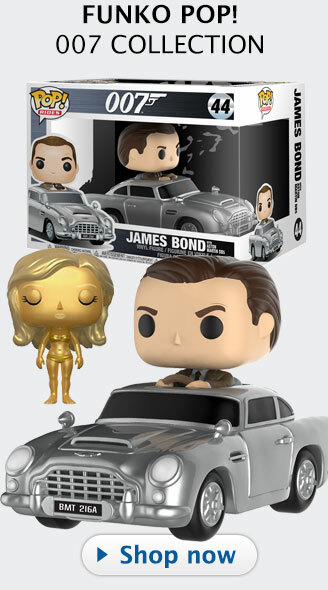 Spy movie and action movie fans alike will love the Cold War setting in the early 1960s, and the 007 fan can enjoy some subtle Bond movie references. 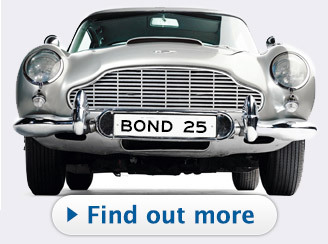 The most exclusive vintage cars, the stylish outfits, handsome spies and ravishing actresses, Guy Ritchie makes it all look ultra-slick, while keeping action and fun at a constant high level. Henry Cavill is outstanding and puts a memorable caricatural spy character on the big screen. Armie Hammer is a worthy partner and Elizabeth Debicki is a stunningly beautiful evil mastermind. If Daniel Craig looks cool again in N.Peal turtle neck sweaters in the poster and trailers for SPECTRE, actor Armie Hammer beats him to the big screen in The Man From U.N.C.L.E. 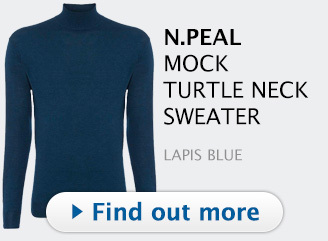 wearing at least as many turtle necks, solidifying the return of the 1960s spy outfit this year. Armie Hammer wears both the light Baracuta G9 jacket and a Black or Dark Navy Baracuta G9 jacket. 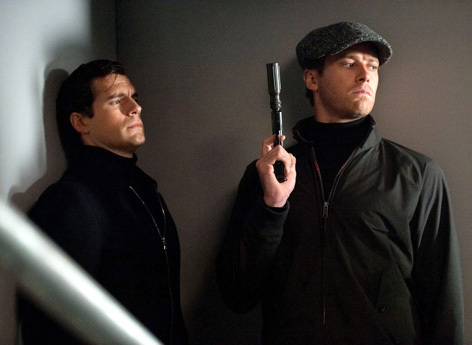 Henry Cavill (left) and Armie Hammer in The Man From U.N.C.L.E. 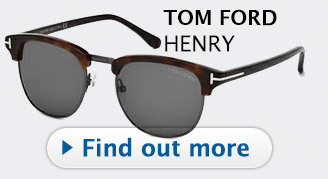 Hammer also wears (although very briefly) the Persol 714 folding sunglasses, as another nod to Steve McQueen. 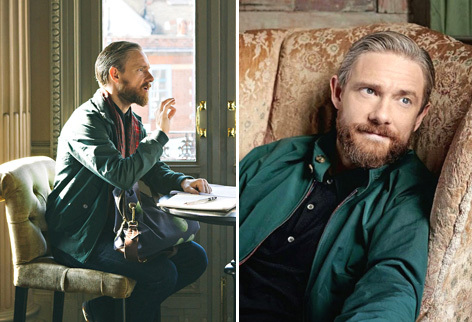 Another fan of the Baracuta is actor Martin Freeman (The office, Sherlock, The Hobbit). 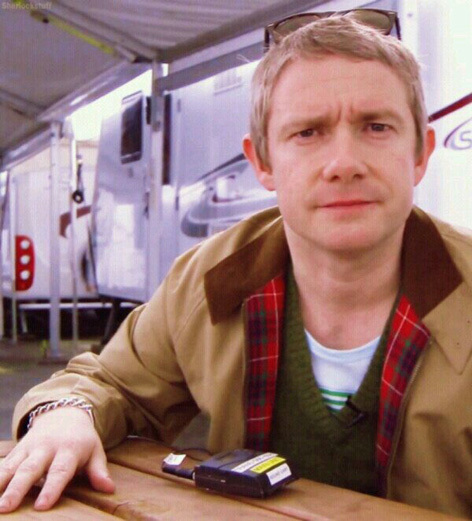 Few people know that Martin Freeman is a fervent supporter (and practitioner) of mod style, with several interviews on the subject. He even wrote the preface to the book "The A to Z of Mod" (written by Mark Baxter and Paolo Hewitt). 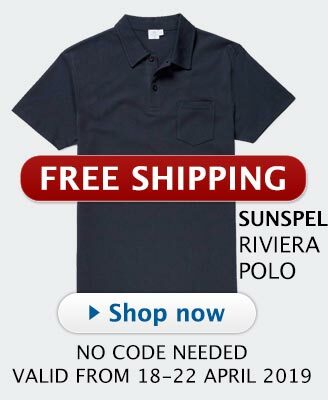 The G9 is available on the Baracuta website. Online stores End Clothing and Stuarts London (get 10% off, read more below) have the G9 in a good selection of colors available. The Baracuta G9 jacket is also available in the most classic colors Navy and McQueen Stone on masonandsons.com (formerly anthonysinclair.com). 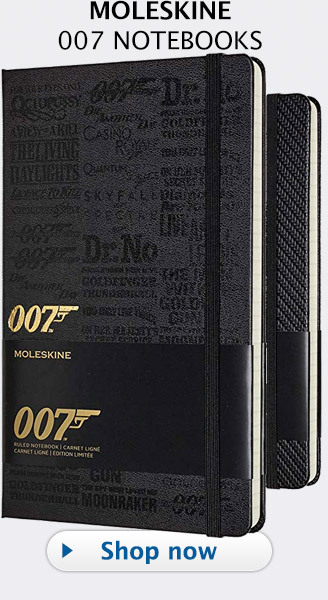 Mason & Sons, the brand started by David Mason who also restarted Anthony Sinclair (the original tailor of Sean Connery in the Bond films) currently offers many other Bond and Steve McQueen inspired clothes on their website. Stuart's London offers an exclusive 10% discount of the Petrol blue Baracuta jacket at the Stuart's London website (worldwide shipping available). Use the exclusive coupon code BONDLIFE10 during checkout to receive the discount. Offer valid until November 6th 2016. 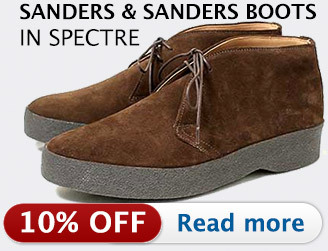 Not valid in combination with other offers. 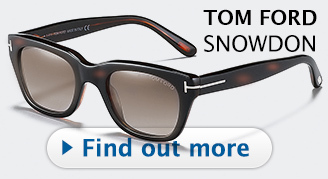 Complete the 1960s spy look by adding a turtle neck sweater and a pair of Persol 714 sunglasses. 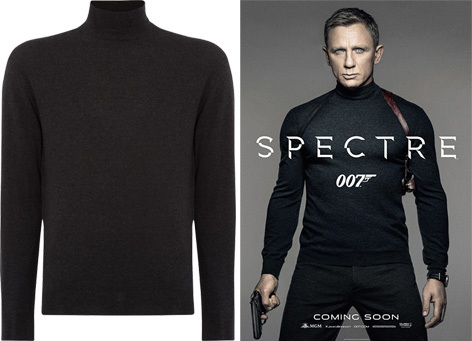 For the turtle neck, get the N.Peal NPG300 Mock Turtle Neck worn by Daniel Craig on the teaser poster and in the trailer for SPECTRE, available on NPeal.com in several colours. 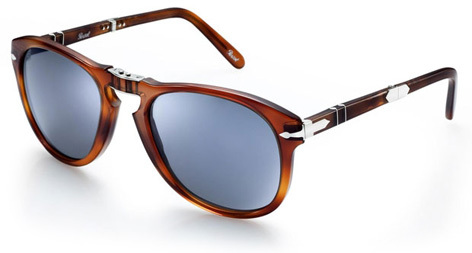 The Persol 714 folding sunglasses, made famous by Steve McQueen and worn by Daniel Craig as well, never go out of style and are easy to conceal as they can be folded up (available at Stuarts London, Amazon.com, Amazon.co.uk, FramesDirect). Guy Ritchie’s The Man From U.N.C.L.E. opens in theaters August 14th 2015. Lee Majors and Douglas Barr wear the Barcuta in The Fall Guy too. 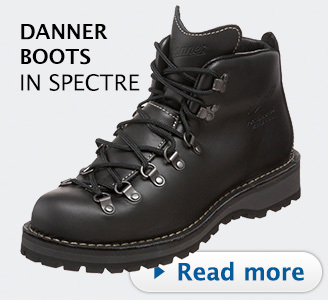 There is a cheaper Version from MERC. Costs 100 €.